While you’re more likely to find marijuana flower on a legal dispensary counter than the side of your house, the plant behind America’s recent medical and recreational boom grows with a quiet resilience. Cannabis originated in central asia, and the first cannabis plants populated the high, dry, cool valleys of central asian mountain ranges like the Hindu Kush mountains. These original strains usually took on the name of their location. For instance, “hindu kush” is a popular strain descended from those first plants. With adequate heat, light, and water, cannabis plants thrive in many climates. Humans began cultivating the plant as early as 12,000 BCE. Cannabis contains fibrous stalks with large nutritional value, making it a great material for rope, shoes, paper, and many other items. 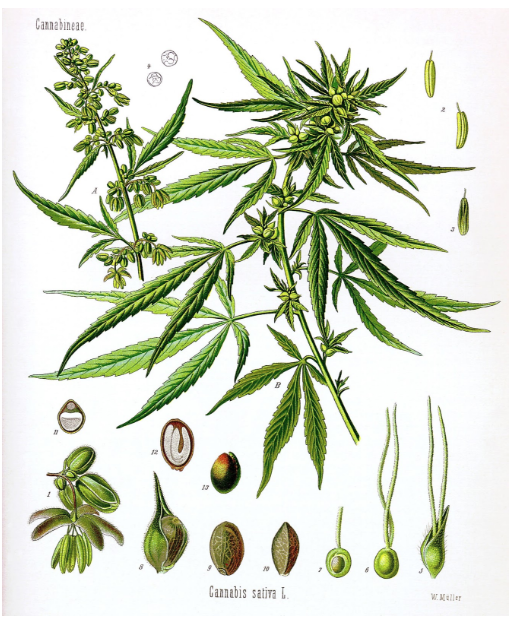 Prior to the first century CE, cannabis seeds had spread and rooted in nearly every continent besides Antarctica due to trade. Cannabis’ remarkable resilience and global ubiquity means you can find wild cannabis in your travels, if you know where to look. 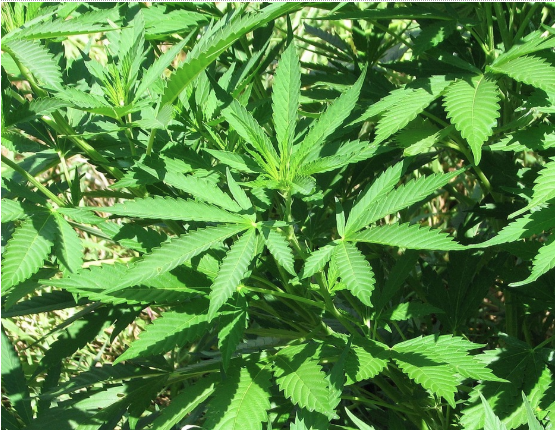 Since cannabis plants only needs just a little water, soil, and light to survive, small niches and unkempt areas that receive sunlight can be perfect spots for sighting wild cannabis. Cannabis grows poorly, and can droop over if given too much water, so you’re more likely to spot a wild plant near drier soil than more damp, fertile ground. Cannabis plants adapt incredibly well to their environments. Original landrace strains, like hindu kush and lambsbread, are cannabis strains that adapted specifically to their local environment. Cannabis’ adaptive faculty allows the plant to thrive in areas where soil and human made structures meet. These places, like roads, allies, and footpaths, are prime spots for finding wild weed. 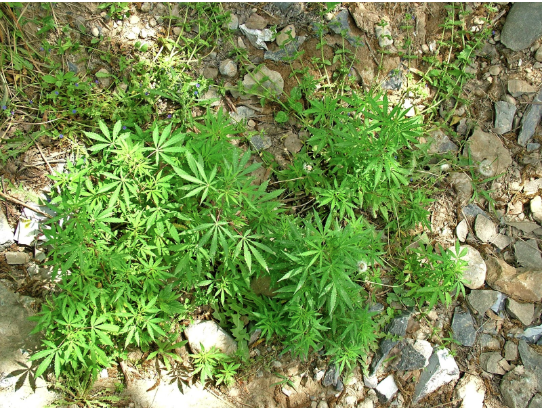 Keep an eye out when you’re hiking, or alongside the shoulder of the road for wild cannabis. But what do cannabis plants look like? What kind of leaf structures should you look out for? Perhaps the most common known family of cannabis, cannabis sativa originated in tropical and subtropical parts India and Southeast asia. You can find cannabis sativa growing in warmer climates like Mexico, Thailand, and South America, among others. While you probably won’t encounter a Sativa plant taller than a basketball hoop in the wild, sativa’s height makes for easy cultivation. Cannabis Indica grows much shorter than sativa, with bushy, fat, stubby leaves that typically grow a darker green than sativas. Cannabis indica has roots in the mountain side landrace strains that grew in colder, drier climates with shorter seasons. 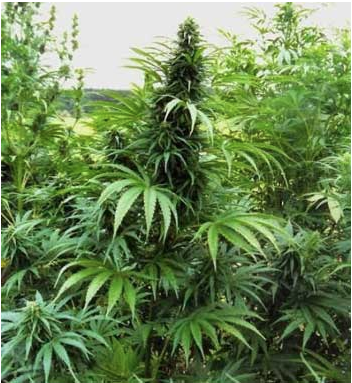 The indica plant grows much shorter and wider than the sativa. As sativa plants extend upward, indica’s extend outward, creating a chubby mass of stout leaves. Indica gets its name from its origin in the cool, dry highlands of Northern India. It makes sense that Indica strains flower earlier, because they originated in areas with shorter seasons and colder climates. As you seek out wild cannabis in your travels, always be sure to avoid trespassing anywhere or infringing on any local laws. Even in states with legal medical and recreational cannabis, foraging for weed can be looked down upon, so always take precaution when you travel to read local cannabis laws and follow them. When was the last time you spotted weed in the wild?